At Earl Butler & Associates we value those people who strive to succeed. We feel it’s important to be recognized for whom, what and why. 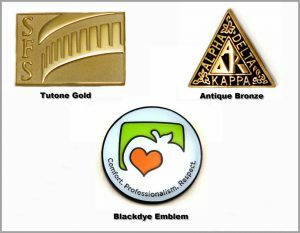 Lapel pins can be very affordable and easily recognizable. Almost on a daily basis you can see someone wearing a lapel pin, whether it’s at your local grocers, your bank or your local home improvement center. Even on TV you will see some of your favorite characters wearing lapel pins. Lapel emblems are the ultimate in recognition of achievement and you can take it with you anywhere. What Can These Awards Be Used For? Dozens of organizations have trusted Earl Butler & Associates with their service awards, employee recognition and more. Our experienced team brings years of design experience to your ideas to help you craft something memorable. We help you leave a lasting impression. Earl Butler established in 1970 has been providing the ultimate personal service and recognition awards of achievements for those who strive to succeed. Producing high class awards or memorabilia, coins and medallions at competitive prices along with knowledgeable customer service and reliable delivery. Each of our recognition awards are skillfully hand crafted and beautifully finished providing a motivation tool that is well within the budget. Our creative customer service personnel help make your job easy by providing expert help in the concept, design and costing for your recognition program. Earl Butler’s emblems and awards are the ultimate in recognition of achievement and you can take it with you anywhere. Copyright 2019 Earl Butler & Associates All Rights Reserved.